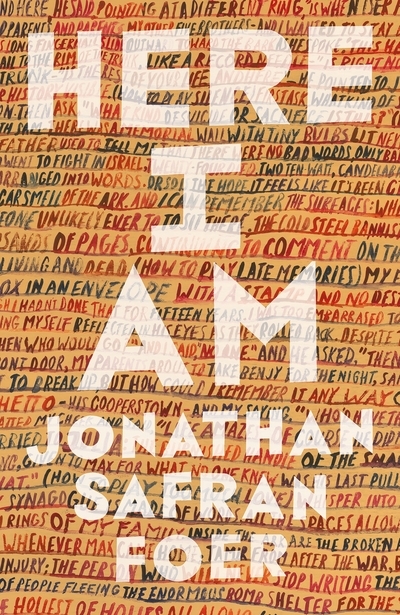 Jonathan Safran Foer has the literary equivalent of a mid-life crisis in his latest novel, the intensely Jewish Here I Am. The title, explained early on in the novel, refers to Abraham’s answer when asked by God to sacrifice his son Isaac. But it could just as easily refer to Safran Foer himself, waving his literary arms and putting his head over the parapet ten years after his well received debut Everything is Illuminated and its post-9/11 follow up Extremely Loud and Incredibly Close. Here I Am is essentially two stories – a domestic tale of the end of a marriage and the global crisis foreshadowed in the first line of the book – the destruction of the State of Israel. The domestic tale centres around Jacob, a writer for television married to Julia for sixteen years with three children, suffering from a mid-life crisis and looking down the barrel of a separation from his wife. The metaphorical earthquake in Jacob’s life is paralleled by a real earthquake in the Middle East leading to an array of Arab forces moving in on a weakened Israel. The global crisis comes halfway through the book and both heightens and throws a spanner into the domestic drama. There is a lot to like in this book but also much that is intensely frustrating. The writing in some places is exquisite but in others feels a little tricksy and self-indulgent. Safran Foer’s style often gets rabbinical, including lengthy philosophical debates between characters, to the point where he has a rabbi give a lengthy speech touching on many of the book’s themes. This speech comes in one of the longest and most successful sections of the book – the funeral of Jacob’s Holocaust survivor grandfather, Isaac. The plot device of the global crisis, while obvious as a metaphor also works to push the domestic drama in interesting directions and draw out many of the themes of belonging and identity. Jacob’s three children are, as children in Safran Foer’s earlier books, unbelievably precocious. Sam, the twelve year old who lives his real life in a virtual reality environment, Max slightly younger but no less scarily intelligent and Benjy the youngster who asks deep questions. It’s hard to know how much broad appeal this book is going to have. Much like Philip Roth, Safran Foer writes in a way that is intensely Jewish and deeply personal. He reflects on the Jewish experience in America and the meaning of Israel to American Jews both as a place and as a concept. He explores the difference in attitude towards Israel of Jews living there looking out and those in the rest of the world looking in. He forensically explores the breakdown of a long term relationship, and often skips into the future to give glimpses of the longer term consequences. Here I Am is lengthy and does not outstay its welcome but it will often test readers’ patience. However, it does reward the effort of those who stick with it.